Back in the 1970’s when NASA launched the two Voyager spacecraft to Jupiter, Saturn, Uranus, and Neptune, I remember being mesmerized by a movie created from Voyager 1 images of the movement of the clouds in Jupiter’s atmosphere. Voyager 1 began taking pictures of Jupiter as it approached the planet in January 1979 and completed its Jupiter encounter in early April. During that time it took almost 19,000 pictures and many other scientific measurements to create the short movie, which you can see below, showing the intricate movement of the bright band of clouds for the first time. Now, 35 years later a group of seven Swedish amateur astronomers achieved their goal of replicating the Voyager 1 footage, not with another flyby but with images taken with their own ground-based telescopes. Animated gif of the ‘Voyager 3’ team re-enactment of the Voyager 1 flyby. Credit: Voyager 3 team, via Kristoffer Åberg. The Swedish team of amateur astronomers who compiled the ‘Voyager 3’ project. Image courtesy Peter Rosén. Congrats to the team of Voyager 3! You can read more about the Voyagers visits to Jupiter here from NASA. Voyager3Movie from Peter Rosén on Vimeo. Big thanks to Nicole Gugliucci (@noisyastronomer) for doing a wonderful job producing this past year! Voyager 1 was able to record the sounds of interstellar space. This helped the Voyager science team calculate the density of interstellar plasma. Read more about the announcement of Voyager crossing into interstellar space here. In a cosmically historic announcement, NASA says the most distant human made object — the Voyager 1 spacecraft — is in interstellar space, the space between the stars. It actually made the transition about a year ago. But Stone now says the evidence in clear: Voyager 1 has made the transition. Voyager 1’s 36-year, 13 billion mile journey began in 1977. Scientists thought that when the spacecraft had crossed over into interstellar space, the magnetic field direction would change. However, it turned out that didn’t happen, and scientists determined they needed to look at the properties of the plasma instead. The Sun’s heliosphere is filled with ionized plasma from the Sun. Outside that bubble, the plasma comes from the explosions of other stars millions of years ago. The main tell-tail difference is the interstellar plasma is denser. Unfortunately, the real instrument that was designed to make the measurements on the plasma quit working in the 1980’s, so scientists needed a different way to measure the spacecraft’s plasma environment to make a definitive determination of its location. Instead they used the plasma wave instrument, located on the 10-meter long antennas on Voyager 1 and an unexpected “gift” from the Sun, a massive Coronal Mass Ejection. The antennas have radio receivers at the ends – “like the rabbit ears on old television sets,” said Don Gurnett, who led the plasma wave science team at the University of Iowa. The CME erupted from the Sun in March 2012, and eventually arrived at Voyager 1’s location 13 months later, in April 2013. Because of the CME, the plasma around the spacecraft began to vibrate like a violin string. The pitch of the oscillations helped scientists determine the density of the plasma. Stone said the particular oscillations meant the spacecraft was bathed in plasma more than 40 times denser than what they had encountered in the outer layer of the heliosphere. Artist’s impression of Voyager 1’s position on the sky when observed by the Very Long Baseline Array (VLBA) on February 21, 2013, at which point — according to NASA’s Jet Propulsion Laboratory — Voyager was already outside of our Solar System. The actual image from the data (enlarged section) is 0.5 arcseconds across. The radio signal as shown is a mere 1 milliarcsecond across. The plasma wave science team reviewed its data and found an earlier, fainter set of oscillations in October and November 2012 from other CMEs. Through extrapolation of measured plasma densities from both events, the team determined Voyager 1 first entered interstellar space in August 2012. The new plasma data suggested a timeframe consistent with abrupt, durable changes in the density of energetic particles that were first detected on Aug. 25, 2012. 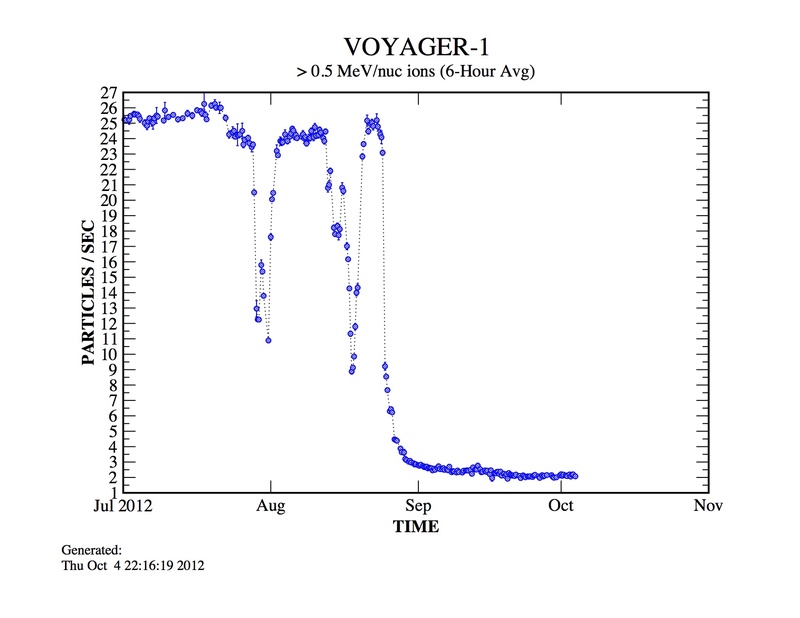 Now, after further review, the Voyager team generally accepts the August 2012 date as the date of interstellar arrival. The charged particle and plasma changes were what would have been expected during a crossing of the heliopause. This reinforces that definitive science results don’t always come fast. There has been some back and forth about whether Voyager 1 was in or out of the Solar System. As we said, it was first questioned in August of 2012, with more speculation in December 2012, then in March of 2013 a paper by William Webber and F.B. McDonald claimed Voyager 1 had exited the Solar System the previous December, but Stone insisted the data wasn’t positive yet. Then about a month ago a paper came out by Marc Swisdak from the University of Maryland saying Voyager 1 was out of the solar system, but at that point Ed Stone and the Voyager team put out a statement saying they were still making that determination. Voyager 1 and its twin, Voyager 2, were launched 16 days apart in 1977. A fortuitous planetary alignment that only happens every 176 years enabled the two spacecraft to join together to reach all the outer planets in a 12 year time period. Both spacecraft flew by Jupiter and Saturn. Voyager 2 also flew by Uranus and Neptune. Voyager 2, launched before Voyager 1, is the longest continuously operated spacecraft. It is about 9.5 billion miles (15 billion kilometers) away from our Sun. “In a sense this is only really the beginning. We’re now going into a completely alien environment and what Voyager is going to discover truly unknown,” said Gary Zank, from the Department of Space Sciences at the University of Alabama, Huntsville, speaking at today’s press conference. While Voyager 1 will keep going, we will not always be able to communicate with it, as we do now. In 2025 all instruments will be turned off, and the science team will be able to operate the spacecraft for about 10 years after that to just get engineering data. Voyager 1 is aiming toward the constellation Ophiuchus. In the year 40,272 AD, Voyager 1 will come within 1.7 light years of an obscure star in the constellation Ursa Minor (the Little Bear or Little Dipper) called AC+79 3888. It will swing around the star and orbit about the center of the Milky Way, likely for millions of years.